OP Financial Group’s operations are based on cooperative ideals, a strong capital base and capable risk management. OP Financial Group's mission and core values as well as strategic and financial targets form the basis for risk management. The strategy outlines the Group’s risk appetite and risk management priorities. Risk management, on the other hand, helps to achieve the targets set in the strategy by controlling that risks are proportional to risk-bearing capacity. In the long term within moderate risk-taking, the Group seeks above-market-average growth. This requires controlled risk-taking relying on strong risk management. Risk management is part and parcel of daily business and its management. Risk awareness and a moderate risk-taking approach are reflected in every business decision and form an integral part of corporate culture. OP manages customer relationships on a long-term basis and responsibly from the perspective of risk management. An example of the role of risk management in banking is that a borrower’s repayment capacity is a key prerequisite for loan approval. Robust risk management is in the interests of both customers and OP Financial Group. Risks associated with OP Financial Group’s business segments differ in terms of weight. Credit risks, structural interest rate and funding risks and funding liquidity risks play a major role in Banking. Meanwhile, interest rate and other market risks are highlighted in Non-life Insurance and compliance risks and life insurance market risks in Wealth Management. Operational risks apply to all business segments alongside the trend towards automated and digitised services. The extent of OP Financial Group provides significant risk diversification benefits. Meanwhile, however, the role of various concentration risks will increase. According to its new strategy, OP will invest in creating new types of service packages and business models in the years to come. Before the company launches any products or services or adopts new operating models or systems, it assesses their risks using procedures as laid down by the central cooperative’s Risk Management. OP Financial Group only offers products to customers and applies business models that have been approved at Group level. The most significant business risks affecting OP Financial Group and their most common management tools are detailed in the table below. Strategic risks Risk caused by changes in the competitive environment, slow reaction to changes, poor choice of strategy or poor strategy implementation. The Group assesses strategic risks as part of the strategy process while identifying related control measures and assessing their effects, for example, on the Group's overall risk exposure and economic capital requirement. The Group takes account of risks associated with its operating environment by implementing proactive risk management and systematically monitoring its operating and competitive environment. Strategic risk is reduced by regular planning, based on analyses and forecasts of customer future needs, developments in different sectors and market areas, and of competition. Operational risks Risk of financial loss or other detrimental consequences caused by inadequate or failed processes, inadequate or flawed procedures or systems or some external factor. 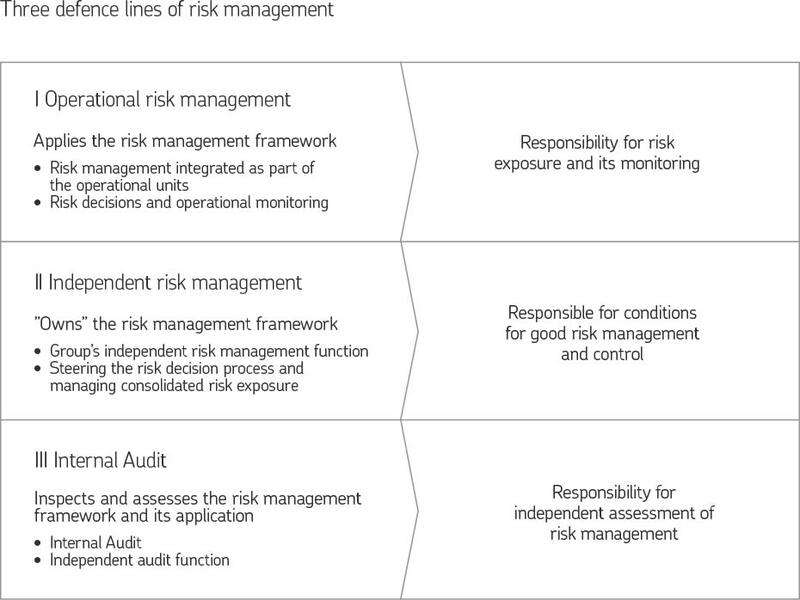 Operational risks also include ICT, security, data security, procedural and model risks. The key area of operational risk management involves identifying and assessing risks and assessing the effectiveness and adequacy of risk control and management tools. Risks that may disrupt business continuity are prepared against by means of business continuity planning in key business divisions. Compliance risk Risks caused by non-compliance with external regulation, internal policies, appropriate procedures or ethical principles governing customer relationships. Managing compliance risks forms part of internal control and good corporate governance practices and, as such, an integral part of business management duties and the corporate culture. Compliance risk management tools include monitoring legislative developments, providing the organisation concerned with guidelines, training and consultation in respect of observing practices based on regulation as well as supervising the regulatory compliance with procedures applied within the organisation. Reputational risk Risk of deterioration of reputation or trust caused by negative publicity or realisation of some other risk. Reputational risk is managed proactively and in the long term by complying with regulation, good practices of the financial sector and OP’s Code of Business Ethics and by emphasising transparency of operations and communications. OP adheres to international financial, social and environmental responsibility principles and international commitments. Credit risks Risk of a counterparty failing to fulfil its obligations arising from debt relationship. Non-fulfilment of other obligations of a counter-party is also known as counterparty risk. Credit risk management in banking is based on good knowledge of customers, strong professional skills and comprehensive documentation. The day-to-day credit approval process and its effectiveness play a key role in the management of credit risks. OP mitigates credit risks by using collateral, financial covenants, central counterparty clearing, netting agreements and exchange-traded products. Market risks Risk of loss resulting from interest rate, price, volatility and market liquidity changes in the financial market. Market risks consists of structural market risk associated with the balance sheet (market risks associated with the banking book and insurance liabilities) and market risks associated with trading and long-term investment. Banking interest rate risk is primarily managed by the choice of the range of borrowing and lending products and the terms and conditions offered as well as by limits and control limits. Moreover, derivatives may be used for hedging purposes. Managing investment risks is based on diversification through effective allocation. Risks are managed through limits (e.g. VaR limits, allocation, credit rating and country risk limits) and investment plans. Insurance companies manage market risks associated with investment and insurance liabilities by means of various investment instruments and derivative contracts. VaR limits are used to limit market risks associated with trading. Liquidity risks Liquidity risk comprises funding liquidity risk, structural funding risk and funding concentration risk. Funding liquidity risk refers to the risk that OP Financial Group will not be able to meet its current and future cash flows and collateral needs, both expected and unexpected, without affecting its daily operations or overall financial position. Structural funding risk refers to uncertainty related to long-term lending, arising from the refinancing risk due to the structure of funding. Funding concentration risk refers to the risk that funding becomes more difficult due, for example, to a transaction related to an individual counterparty, currency, instrument or maturity band. OP Financial Group manages its liquidity position through the proactive planning of the funding structure, limits and target levels, the monitoring of the liquidity status and a well-balanced liquidity buffer, planning and management of daily liquidity, the business continuity and contingency plan based on emergency preparedness, as well as the effective and ongoing control of the Group's liquidity status. Non-life Insurance risks Non-life Insurance risks comprise risk of loss or damage, and provision risk. Risk of loss or damage occurs when there are an above-average number of losses or they are excep-tionally large. Provision risk arises when the claims incurred due to already-occurred losses are higher than anticipated on the balance sheet date. Risk selection and pricing, the acquisition of reinsurance cover, the monitoring of claims expenditure and the analysis of insurance liabilities are highlighted in underwriting risk management. Life Insurance risks Life Insurance risks comprise biometric risks, cost risk and customer behaviour risks. Biometric risks occur when claims paid out are higher than expected or for a longer period than expected. Customer behaviour risk means early termination of insurance premium payment or the insurance contract or its change on the basis of the option included in the contract. Expense risk refers to a situation in which incurred insurance contract management expenses differ from those estimated in rating. Life Insurance underwriting risk management tools include prudent premium rating, careful selection of exposure and reinsurance. Diversifying insurance between different insurance types also reduces risks. Life Insurance reinsures, when necessary, any major individual risks and risk concentrations. Customer behaviour risk is managed by means of a competitive product range, suitable product structures and incentives and sanctions in the insurance terms and conditions. Concentration risks Risks that may arise of a business’s excessive concentration on individual customers, products, lines of business, maturity periods or geographical areas. The management of concentration risks is closely integrated with other risk management, with the related tools including limits, maximum allocations, diversification and economic capital requirement. OP Financial Group’s risk management is based on three lines of defence. The first line of defence consists of risk management applied within business and other operations. It controls risk decisions and monitors risk exposure. Customer knowledge acquired through active customer relationship management ensures that risk-taking is moderate and guarantees the prerequisites for successful risk management. The second line of defence consists of risk management independent of operational business organisations. 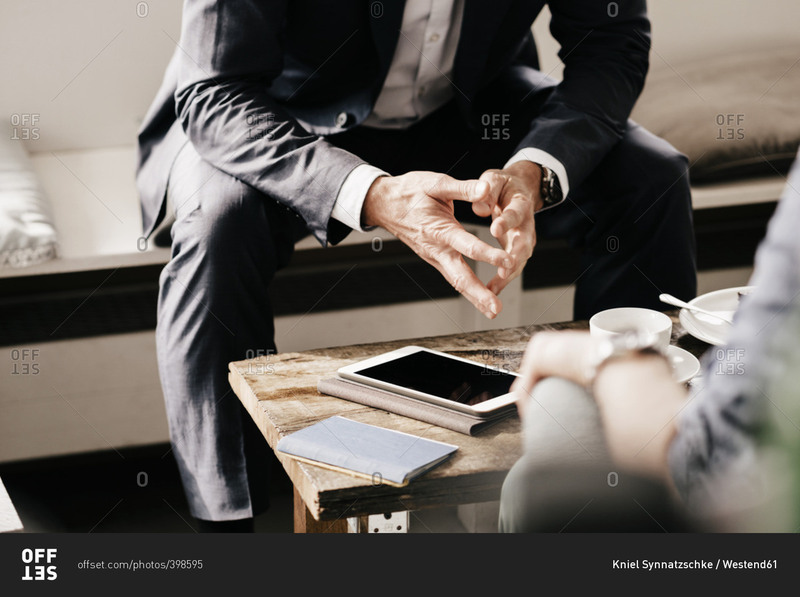 In charge of general risks management conditions within OP Financial Group, it controls, supports and supervises the implementation of the risk management principles, confirmed by the Supervisory Board, at OP Financial Group and its entities. The third line of defence involves centralised Internal Audit, which audits and assesses risk management performed by both the central cooperative and member entities.